Price was the primary influence in the development of this system. After all, not everyone needs the four to six detectors of an Astoria Analyzer, and there are several laboratories with PQLs that discrete analyzers can’t hit. 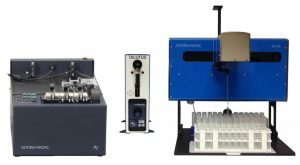 The two (2) channel Astoria2–having combined the pump, cartridge base and detector into one solid unit–provides the cost-conscious laboratory the means to run all the applications the Astoria Analyzer can, and all the applications that a discrete cannot. The use of optional fluorometric, UV and Flame photometric detectors. The performance of the Astoria2 is outstanding. For instance, if a lab is looking to run low-level orthophosphate, it can choose Astoria-Pacific’s ultra-low-level method*, which has a working range of 0.0005 – 0.5 mg/L as P. This is possible because the Astoria2 uses the mechanical assemblies that have made the Astoria Analyzer one of the strongest performers in the market place. As the lab expands its testing parameters, the Astoria2 is fully adaptable and can be upgraded as needed. It can make use of optional plug-in detectors and/or be expanded to a four (4) channel system by simply adding another Astoria2 module. Continuing the tradition of reliability and robustness of SFA, the Astoria2 is a strong performer for the modern laboratory.